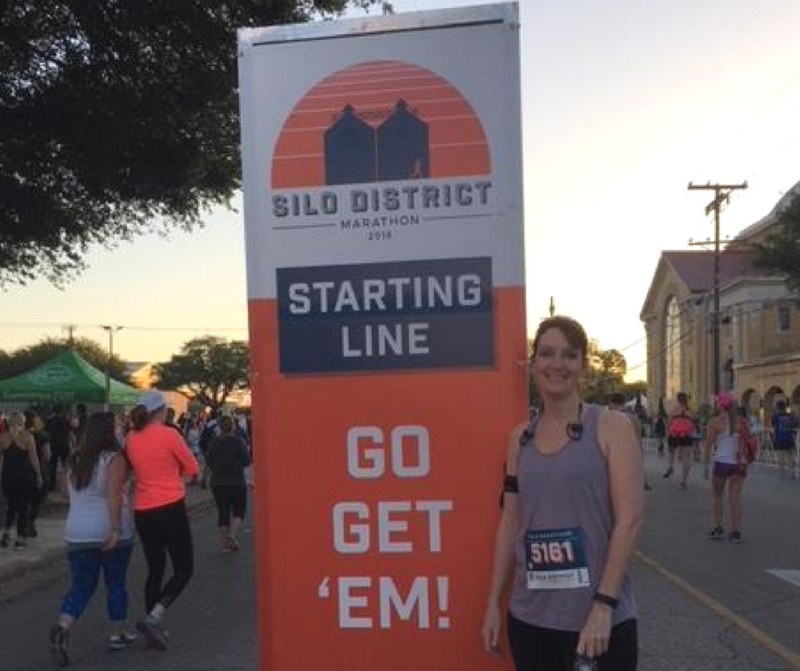 I had the opportunity to participate in the Silo Marathon in Waco, TX put on by Chip and Joanna Gaines this weekend. I ran in the half marathon race. 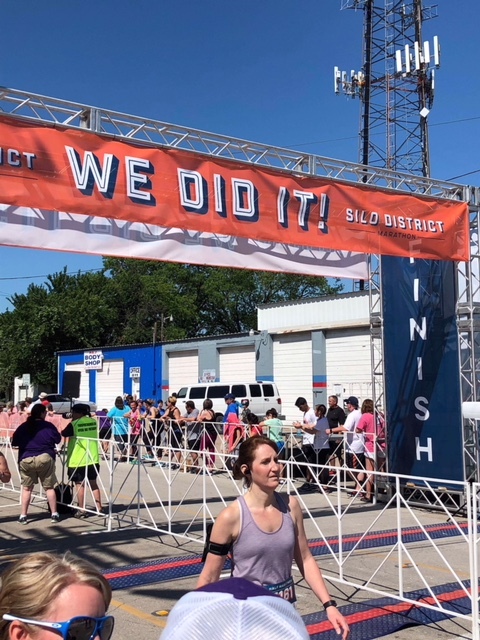 The experience included a surprise visit by a dear friend, the support of my son, a Silo finishing medal, and last but not least, a Chip and Joanna sighting! Nathan traveled down to Texas with me which really has been such a blessing. We were so fortunate that the hotel we were staying at was only 3 blocks away from where the race would start and finish. I was able to get up and only walk 3 blocks to get to the starting line. I was so thankful for all of my husband’s traveling hotel points! My friend, April, who came to see me off. 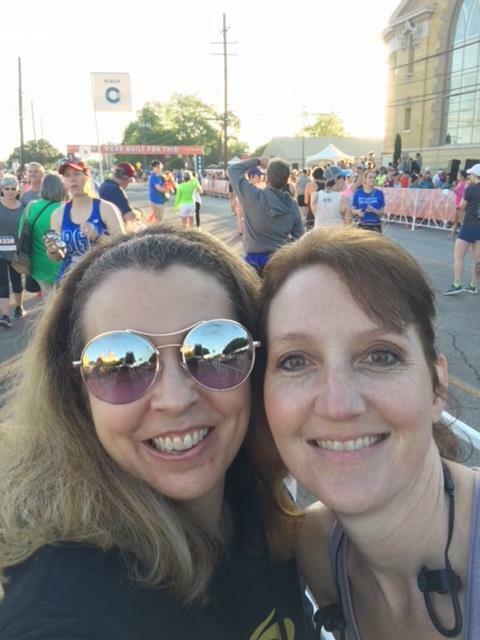 My dear friend, April, texted me after I had left the hotel and said she was waiting to see me start the race. She had driven down the night before the race and slept in her car to be able to see me start the race! Can you believe that? I was really truly touched! Joanna Gaines blowing the air horn to start the full marathon. 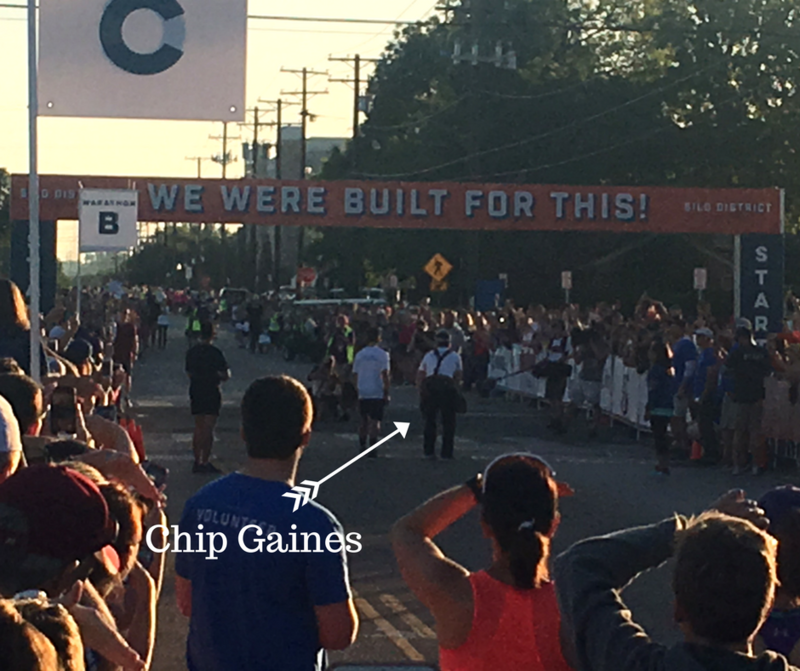 We were able to see Chip Gaines start out his race for the full marathon. This is the first marathon he has ever done. Joanna sounded the air horn to start the race and all of the full marathoners started out on their run. They waited until all of the full marathoners had run out ahead before Chip stepped out onto the course. 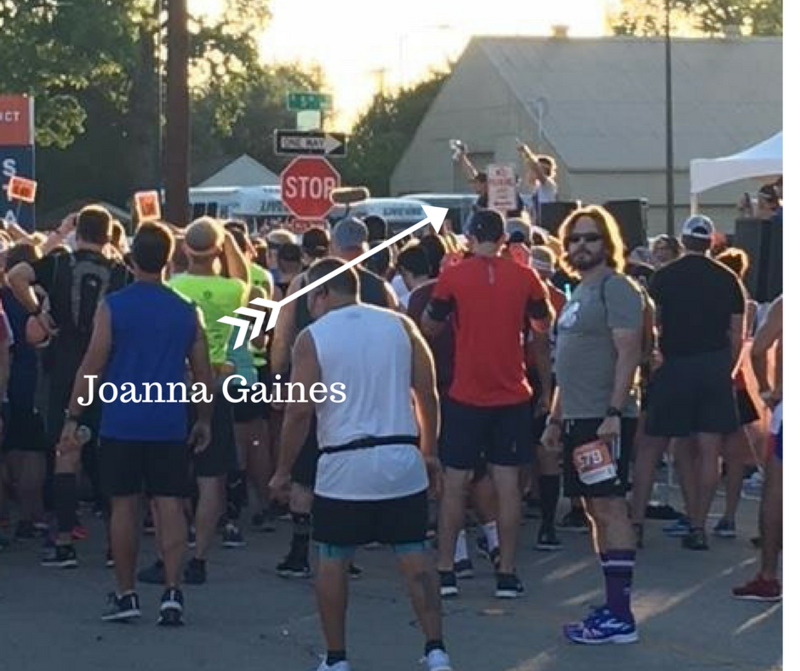 Chip Gaines starting his full marathon. He started out his race in worker’s pants and a tool belt. There was an entourage running in a circle around him. Apparently, he had a crew which were filming him and/or protecting him. I bet they were wishing they hadn’t signed up for that job! A pic of me at the starting line. I started off the race feeling really good. I got to about mile 7 or 8 and really just started feeling nauseous from the heat. It was just hotter than I am used to along with the humidity. 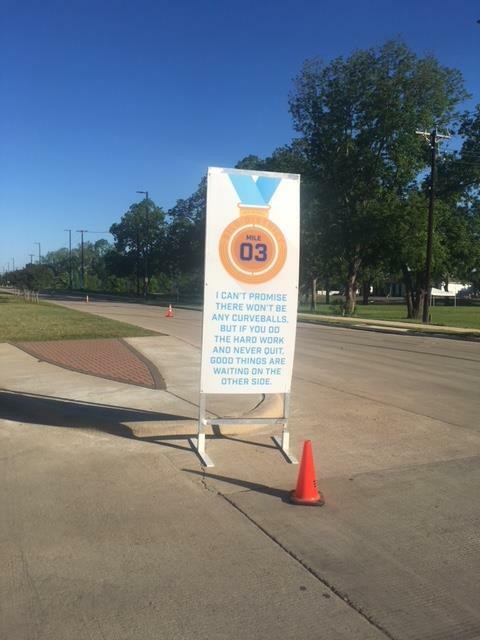 I continued to run my pace until about mile 9 where I decided I was going to walk. Every mile marker had an inspirational quote. The worse case scenario in my mind has always been to get an injury where you couldn’t finish the race due to that injury. My second worse case scenario is to walk the whole thing. 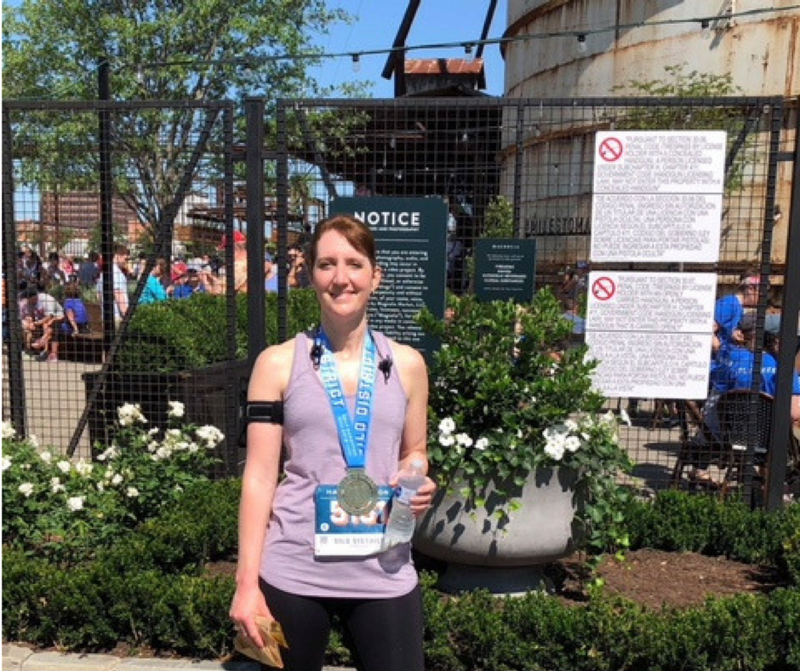 So, my time for this race was not what I would have wanted it to be, but in the moment, I had to do what was best for my body and just resign myself to walk for most of the rest of the way. I tried to keep up with one of the pacers for a few miles in the middle of the race. At one point, I was ahead of the pacer. Then I stopped for water and dropped behind the pacer. I realized at one point that I was so concerned about where the pacer was and what they were doing that I forgot all about running my own race at my own pace of how I trained. I kept telling myself, “Just run your own race.” I didn’t come to run anyone else’s race other than my own. I didn’t train with Sara or Patricia or Oliver. I trained for my race, and I needed to run my race at the pace which I knew I could do. I ended up finishing the race and so thankful to have done it with no injuries. I got out there, did it and finished. What a praise! Here is what I was thinking in this moment…I want to sit down! I couldn’t help but think of a sermon at our church about our Christian walk (race), and how we should just keep going. We should run this race of life set before us with endurance (Hebrews 12:1). It is easy to see others who are running a different race than we are and wonder why our race is not the same as theirs. Stop comparing yourself to others! God has a special race for you as well that is different from anyone else’s race (Ephesians 2:10). God intended us to all be parts of one body (Romans 12:4). 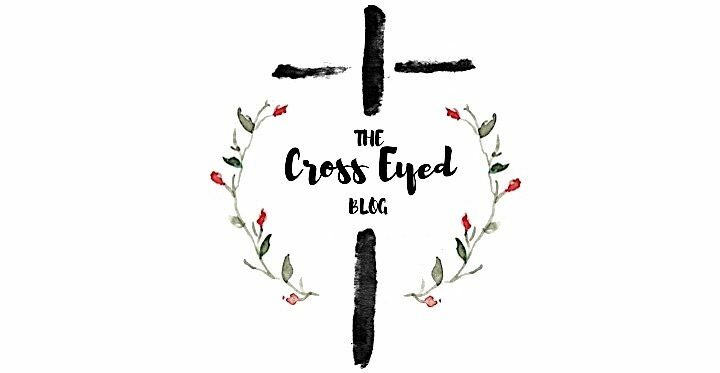 If all of God’s people only worked as the big toe and the left arm, we would not be very effective as a body as a whole. At the end of the race with a Magnolia sugar cookie in hand. It was yummy! So, run your own race today and everyday. Believe in yourself and in Christ. He is faithful to complete any good work He has started in you (Philippians 1:6). Just run your race!